"Can be served over rice or noodles." Heat oil in a large, heavy skillet over medium heat. Add onions; cook and stir until tender, about 10 minutes. Transfer to a bowl. Cook and stir beef in the same skillet until browned, 1 to 2 minutes per side. Sprinkle flour, marjoram, thyme, and pepper over beef. Pour red wine and beef broth into the skillet; stir well. Reduce heat to low and simmer until beef is tender, 1 1/2 to 2 hours. Stir onions into the skillet. Add mushrooms. 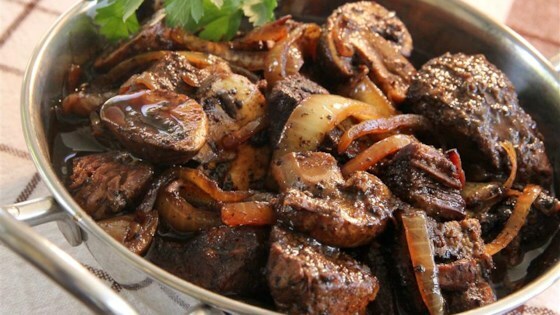 Cook, stirring, until mushrooms are tender and sauce is thick and dark brown, about 30 minutes. Substitute olive oil for the vegetable oil if desired. Add beef broth and wine (1 part broth to 2 parts wine) as needed in step 2 to keep beef barely covered. Mine came out really bland, even after adding a lot of salt. It had too many onions. They dominated the dish. Rich and simple! Great recipe! Will make again, served over mashed potatoes . Next time want to try over homemade noodles. I liked this a lot but it was a little bland. Next time I will add salt and some red pepper. The top round cooked to perfection in the wine based sauce. It turned out to be very tender. My husband is quite please with this french dish.